Autor: Wilkinson, Jonathan; Pennefather, Stephen H.; Mc Cahon, Robert A. 1st Edition 2011, 786 p., various line illus. 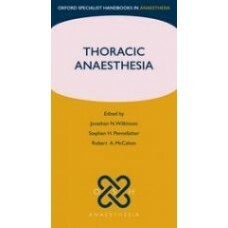 Thoracic anaesthesia is regarded as a post fellowship sub-speciality within anaesthesia, and can be daunting. This handbook provides an easily accessible, informative, and palatable guide to this often complex subject. The text is sub-divided into basic sciences, pre-operative assessment, diagnostic procedures, and an anaesthetist's walk-through of key thoracic surgical procedures. It concludes with an emergency section covering thoracic anaesthesia emergencies, critical care, and the thoracic surgical patient, and ends with essential guidance on the relevant practical procedures necessary to manage cases. The text provides an essential reference for the core curriculum of the Fellowship of the Royal College of Anaesthetists and for the day-to-day practice of post fellowship anaesthetists alike. The discussions of the surgical procedures are simple, highlighting the poignant stages that can affect the anaesthetic management of the patient. The authors use the very latest evidence in order to keep the reader up to speed with developments in the field. Whether on-call, running day-to-day lists or working within critical care, this indispensable guidebook will optimise the preparedness of all staff in dealing with any case, whether simple or complex.